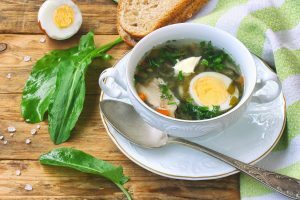 Soup for breakfast might seem like an alien concept to some, but here at Sadie’s Kitchen we love nothing more than a warming bowl of broth on a cold winter’s morning. The addition of the egg, delicious bread and some healthy greens, makes this the perfect start to any day. Sure to get you to lunch time and keep you fighting fit against cold and flu season. This soup works great with either poached or boiled eggs. Boiled eggs are particularly handy because you can cook them the night before and have them ready to go for the morning. If you like the idea of a poached egg, we recommend poaching it directly in the broth for maximum flavour. Sure give it a go, anyway. We bet you will love it! *If a poached egg isn’t your thing, or too much work on a busy week day morning, a boiled egg works just as well.